The glitch's effect in Melee. Notice the lack of team shading. 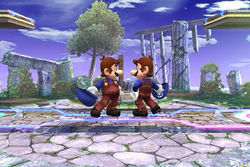 The Same color glitch is a glitch in Super Smash Bros. Melee and Super Smash Bros. Brawl activated in VS Mode that causes two or more players to have the same alternate costume without being in Team Battle or having the shaded versions of the color scheme. This glitch was completely fixed in SSB4 and Super Smash Bros. Ultimate. The player with the desired color scheme must deselect the character. The other player must quickly press the X or Y button to highlight the desired color scheme. 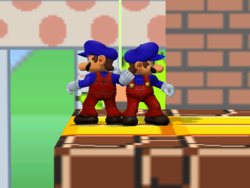 If done correctly, both players can select the same color scheme. Unlike in Team Battle, however, there will be no shading on either players' character. This process must be repeated every time a match is finished/exited, because highest port (closest to P4) takes the color chosen and from there each port (starting with P1) takes another color. This glitch can also be done with up to four players by following a more advanced version of the above process. The glitch's effect in Brawl. This glitch can also be done by three or four players, as well as CPUs. Each additional player should perform steps 2-7, but each player must be done individually and all existing players will have to drop out/join in steps 3 and 6. The same glitch may also occur, though rarely, when one player selects Random as their character. This page was last edited on March 4, 2019, at 03:25.